Advertiser.ie - THE SKEFF LATE BAR & KITCHEN LAUNCHES A NEW MENU FOR 2017! Our chef has been busy developing an exciting new menu at The Skeff, and it’s amazing. From prawns to penne and from beef to brownies, you will have trouble making your selection. But then, you can always come back another time! With the Wild Atlantic Way right at our doorstep it’s no wonder that we placed some considerable emphasis on fish and seafood. In fact, there are three of our starters that use fresh seafood as the main ingredient. Our Garlic & Chilli Prawns are served with garlic bread. Or how about our Seafood Chowder which is served with homemade Guinness bread. Our tasty Fishcakes are served with roasted red pepper may for that extra kick. And then check out our mains fresh from The Atlantic. A perennial favourite is beer battered Fish n’ Chips accompanied by our sensational homecut chips. Or if you’re interested is fish with a more Asian feel, try our Teriyaki salmon which comes on a bed of wok-fried vegetables and egg noodles. Our delicious seafood and freshly landed fish is supplied to us by Creaven Seafoods. We only use Irish beef in our dishes and we can unashamedly say that it is the best in the world. A number of of our mains on this stunning new menu are created around beef as the main ingredient. Our Beef Cottage Pie with champ topping is a hearty dish and for a complete contrast you could choose the pork and beef Italian Meatballs with linguine pasta, shaved parmesan and garlic bread. From the Chargrill you can select a Steak Sandwich, Skeff Irish Beef Burger, a tasty 8oz Rib-eye Steak or a 10oz Sirloin. The steaks are served with homecut chips, crispy onions and flat cap mushrooms. The juicy steaks are expertly cooked to your liking and come with either Jameson peppercorn sauce or garlic butter. For a change you might choose our succulent lamb dish – Braised Lamb Shank in red wine, roast vegetables and creamy mash. Get your meal started with our Skeff Spicy Chicken Wings or how about our Caesar Salad with chicken, baby gem lettuce, shaved parmesan, smoked bacon, croutons and Caesar dressing. For your mains you can select our Sizzling Fajitas with chicken (or beef ) with homemade guacamole, tomato salsa and sour cream. The Jerk Half Roast Chicken is marinated for 16 hours in Jamaciam jerk spices and you will be able to savour every one of them. This dish is served with mango salsa, homecut chips and coleslaw. We and also cater to the vegetarian or to those who are just not in the mood for meat or fish. Our Fried Goats Cheese Balls are served with honey & toasted pistachios. The Pan-fried Mixed Garlic Mushrooms are cooked in creme fraiche and garlic butter, and are served on toasted walnut bread and finished with shaved parmesan. For mains you might select our Creamy Mushroom & Leek Penne, white wine, shaved parmesan and toasted pine nuts. Our homemade deserts are simply to die for. Our Salted Caramel Brownie is just the perfect end to a delicious meal. You might choose our Rhubard and Custard for nostalgia. Our Warm Apple Franipane Tart is always a winner as is our Sticky Toffee Pudding which is served with homemade butterscotch sauce and either cream or ice-cream. Finally our Chococlate Fudge Cheesecake will tickle you taste-buds in all the right places. 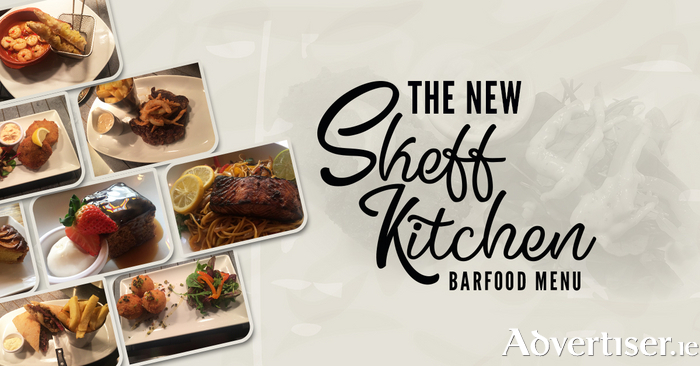 As you will see, at The Skeff, we have created an imaginative new menu that has something for everyone. We only use the finest fresh ingredients in all our dishes and we source locally where possible. Our menu is coded so that you can be assured of selecting dishes that are gluten free, dairy-free, nut-free etc. Our expert servers will also be able to assist you with your choices. There is only one thing we want to know. When are you popping by to sample our new menu? Come to Café Temple and worship at the good food altar. 56 Central Restaurant turns 2 with new Summer menu! !